Well, that was quick. 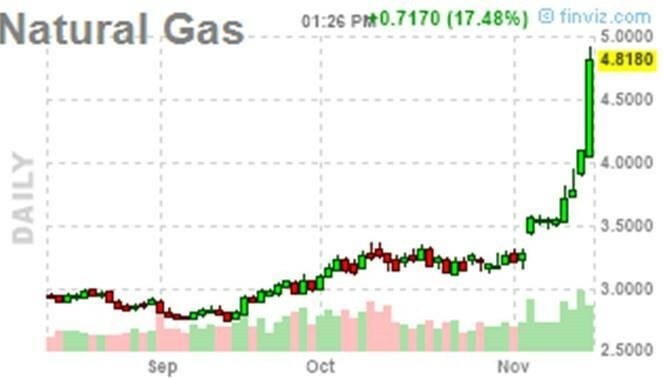 We were hailing natural gas futures as the return of the widow maker just before Thanksgiving as it headed up close to $5 per MMBtu. 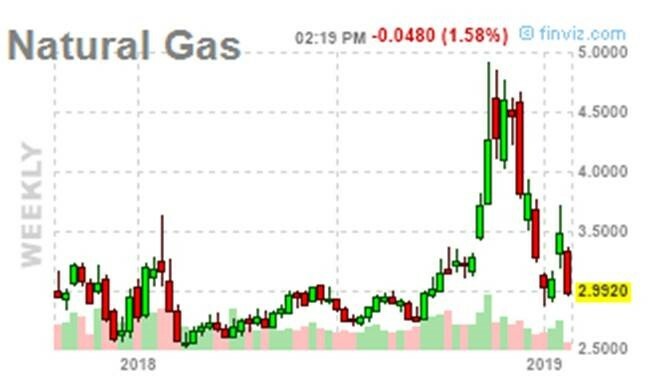 But a few holidays later following MLK weekend, the natural gas news isn’t good – as we’re back down nearly $2 lower, representing a loss of about -30% in less than 10 weeks time. 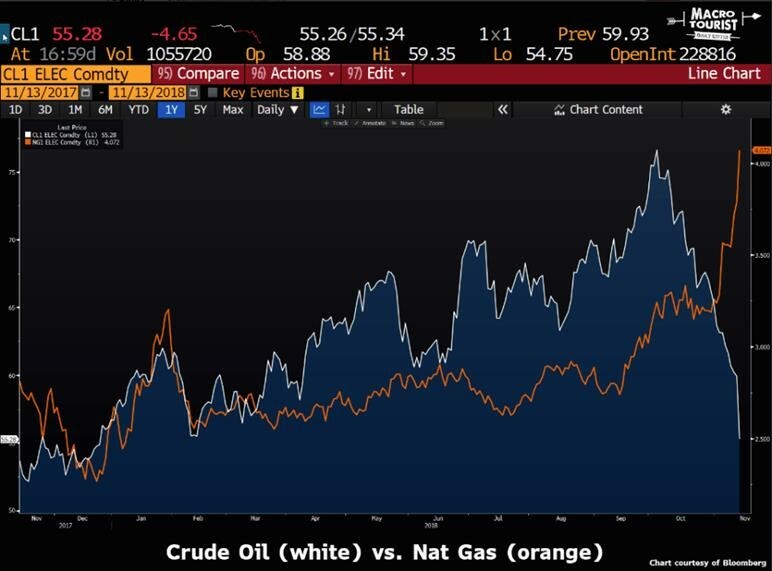 The truth of the matter is that there is a behemoth out there that was long crude oil against short nat gas (along with short nat gas spreads)….do you really believe that is was enough to spike the front nat gas future from $2.75 to $4.03? A 46% increase in a couple of months? C’mon – that’s not weather. Still don’t believe me that someone is offside? 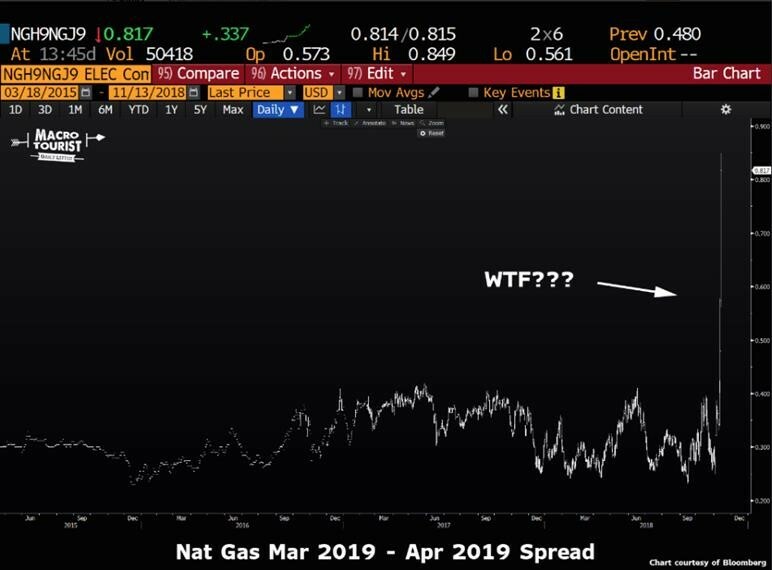 If you can come up with a fundamental reason for the March/April 2019 nat gas spread to spike like this, then by all means, please pass it along. This week’s move in both crude oil and nat gas was not the result of some well-thought-out fundamental reasoning. Rather, in large part, it is due to a large hedge fund calling up their broker at 1-800-GET-ME-OUT. The hedge fund(s) with this position has probably given away a large portion of their profit getting out. They have been taken to the wood chipper. I know there will be all sorts of attempts to explain the markets through fundamental reasoning. Ignore them. Someone big just hit the puke-point for unwinding their long crude oil short nat gas (and nat gas spreads) position. It’s as simple as that. That’s why we are hitting record number of down days in a row. And it will only end when they are finished selling their crude and buying back their nat gas. The question for systematic traders is what do you do with this sort of price action. The breakout to new highs likely triggers all sorts of technical BUY (!!!) signals, breaking out of Bollinger bands, creating moving average cross overs, and printing new multi-week, multi-month, and multi-year highs. But not all technical breakouts are fundamental breakouts. As Heisenberg says, do you really think a spell of cold caused prices to spike? There’s an argument here for discretionary overlays on systematic models, but that’s a path fraught with issues, and only a select few have the energy sector chops to be able to sort fact from fiction in the price history. And of course, there’s that whole thing that you’ll run out of money before the market returns to normalcy. For a systematic program, the trick isn’t necessarily filtering out these types of trades as false moves. They need to be involved with nearly every breakout move to ensure they catch THE breakout move. The trick is not losing your shirt, or even a material amount of buttons, when such a move proves to be a false breakout. To solve for that, systematic models have the risk control built right into the algorithms. Here’s what the per contract “risk” of a natural gas trade may look like through a systematic lens over the last few months. 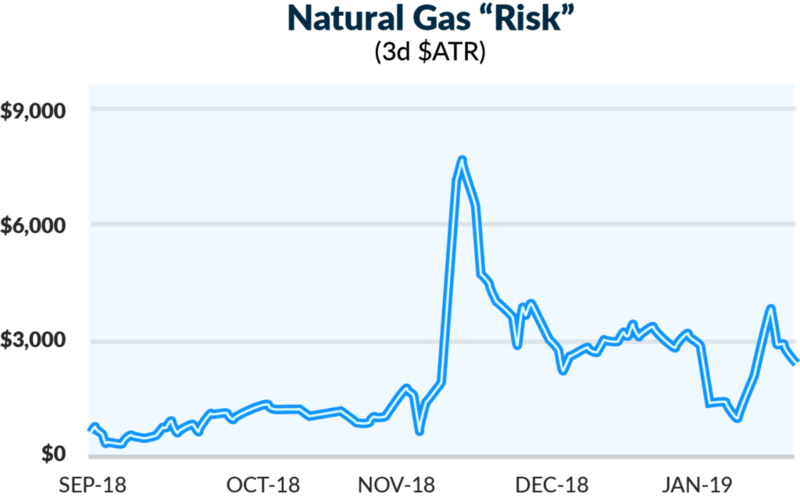 You can see here that the price of Henry Hub Natural Gas wasn’t just exploding higher, but so was the risk – as measured by the volatility of that price. Consider this breakout from the position sizing standpoint. 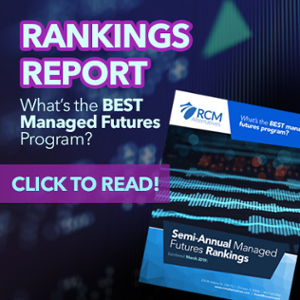 A typical systematic model trading many markets may risk something like one half of one percent of its equity per trade. In this case, we’ll assume the model considers the three day average true range as the risk amount on the trade. With those assumptions, we can see that a systematic program with $1 million in trading equity would have been looking at trading about four contracts in October of 2018 ($1mm*.50% = $5k / $1.1k risk = 4.3), while only doing a single contract (25% less exposure) just a few weeks later in mid-November ($1mm*.50% = $5k / $6.2k risk = .8). The goal is to be anti-fragile, as Taleb would put it, by dynamically adjusting position sizing as the market shows more or less riskiness. It’s the ‘live to fight another day’ mantra, quantified and codified into systematic trading algorithms. For more on how systematic strategies identify trends, see our post analyzing the flip side of this trade, the crude oil sell off from October – November.